We’d love your help. 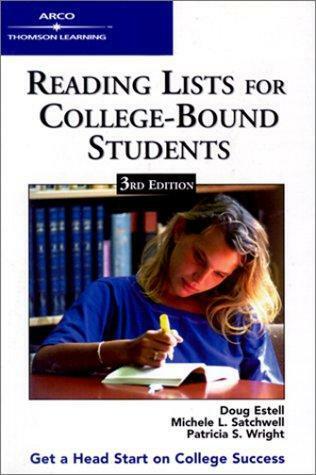 Let us know what’s wrong with this preview of Reading Lists for College Bound Students by Doug Estell. To ask other readers questions about Reading Lists for College Bound Students, please sign up. I had no clue which classics I should start with, so this book helped me out. I started highlighting it in 9th grade and I really should get the new edition. Since I'm a bibliophile and classics lover, this book of lists was a delight. Ummmm.....I was SOOOOOO not reading the books on this list while I was in high school...I was reading V.C. Andrews and the opposite of classic and heavy literature! I will have to add what I did read in high school from this list to good reads...but it is pretty short. Reinforces why I majored in English. So many good suggestions and books to add to my already massive queue!